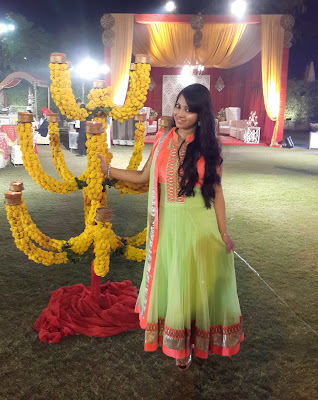 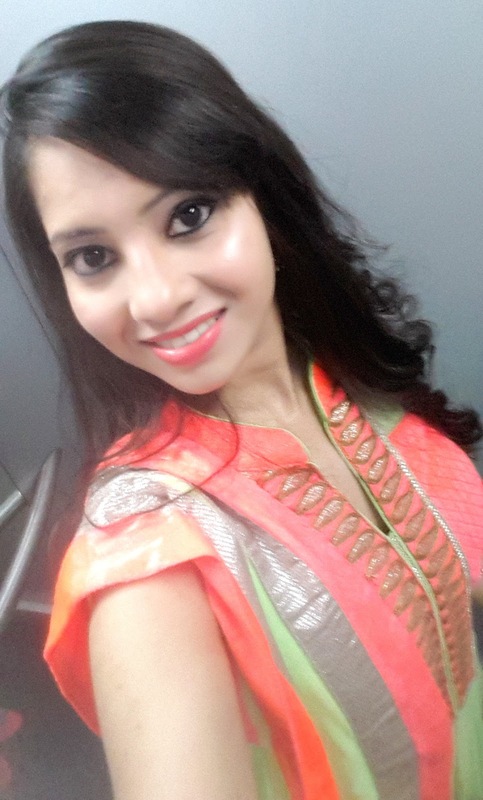 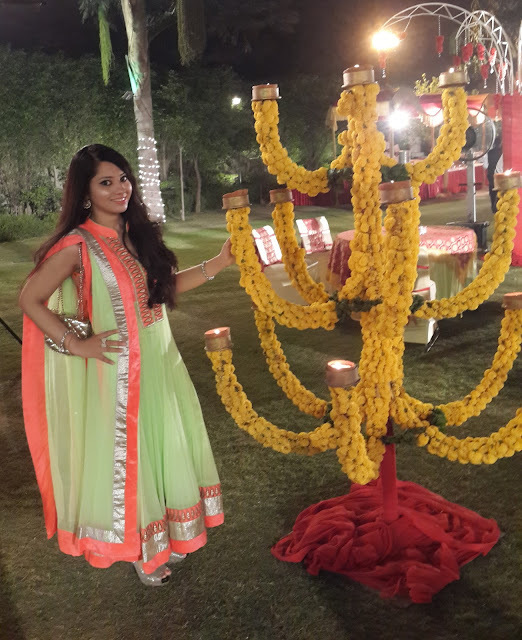 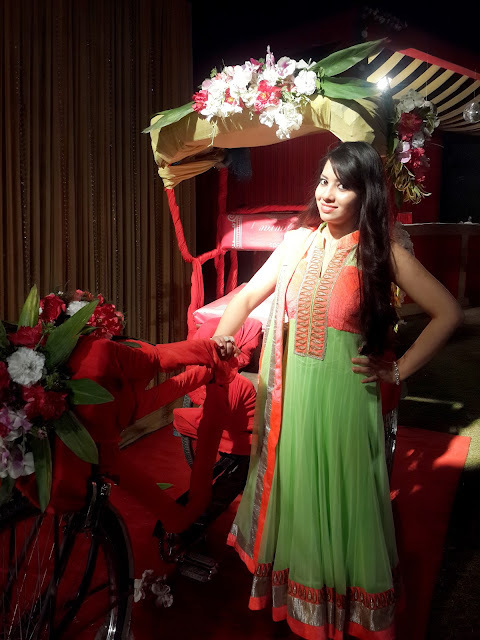 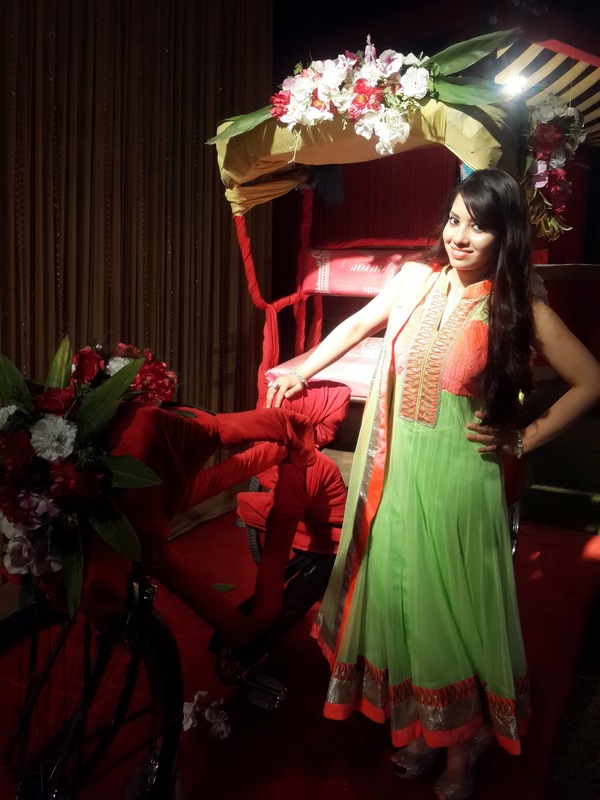 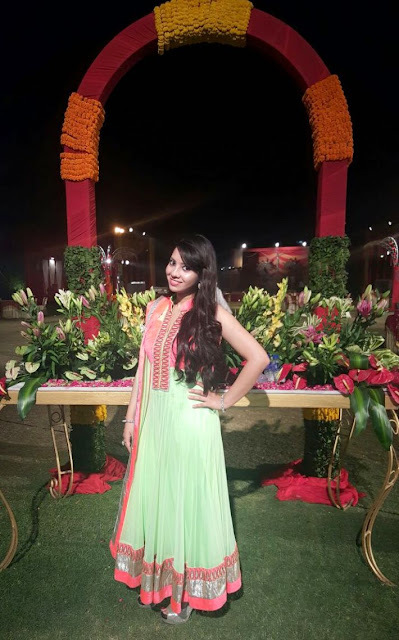 So i wore a beautiful Neon green and neon orange coloured anarkali from MEBAZ . I picked it up from an exhibition in TAJ Krishna in Hyderabad 2 years ago. 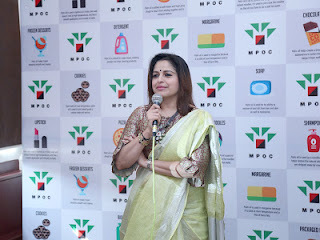 Mebaz is a short form of Meena Bazaar whose outlets are there in Delhi, mumbai etc. 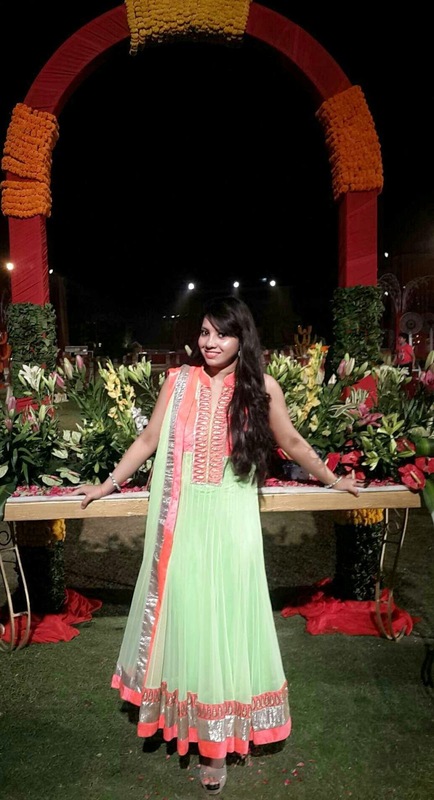 So i wore a net anarkali in lime green color with golden border along with neon orange velvet border and it pleated from the bottom in a flowy style which made it look simply sheek and gorgeous. I paired it with silver heels from a showroom in Rajouri. 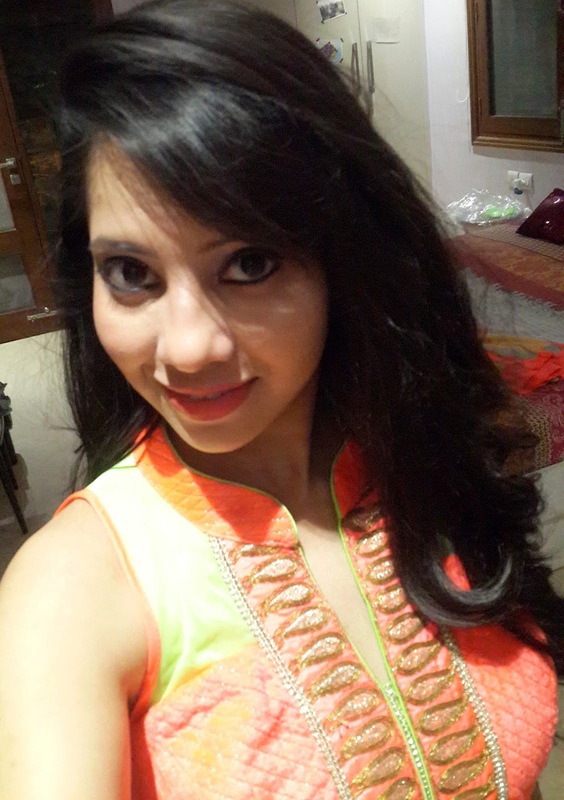 So now lets get onto my hair.. 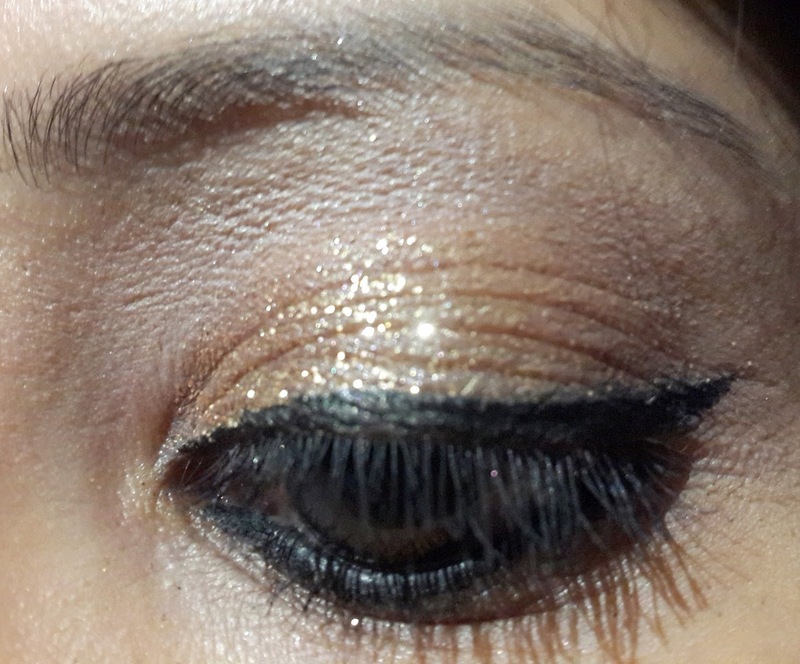 I started with my eyes as i had to do a Gold glitter eye for the wedding . 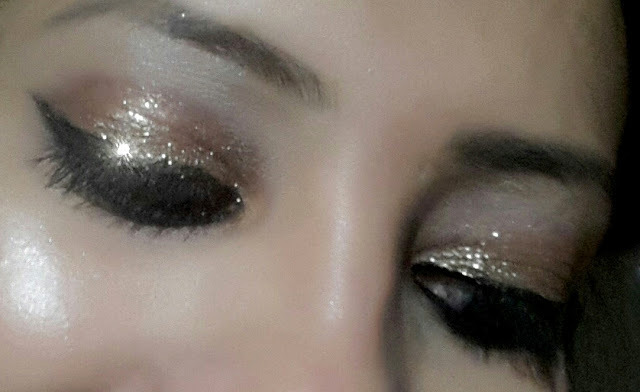 I had to place a wetwipe under my eye to avoid glitter fallout. 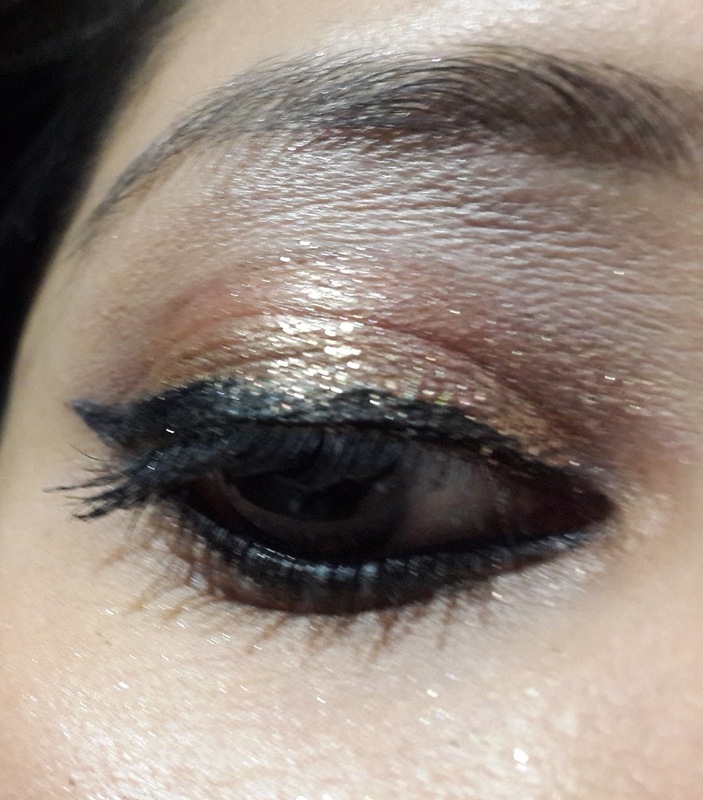 Then i started with a goldeny bronze eyeshadow from my Makeup Revolution Salvation palette (girls on film) and tuk a matte brown for my crease and blended it well, then i took may synthetic brush and sprayed with MAC fix+ to pat down GOLD Glitter until it stuck from my faces glitter stackables eyeshadow (which i have reviewed for u,click on its link to check it) :D Then finished with my Sephora curved eyeliner (waterproof one) and applied Loreal million lashes mascara. 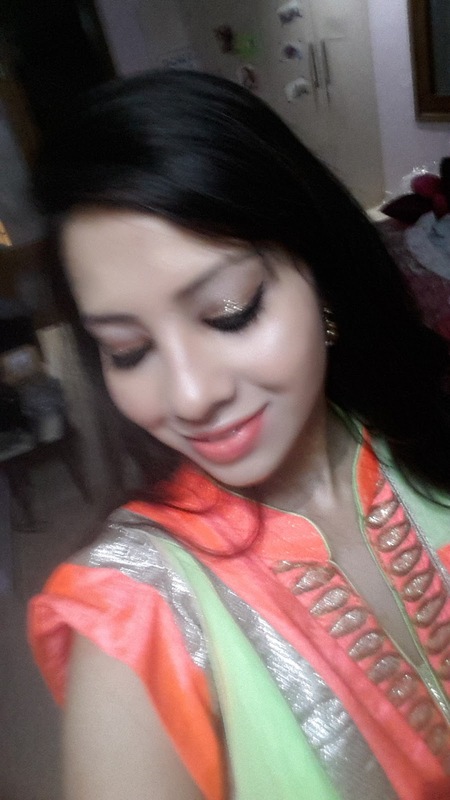 This is the best my selfie cam could take ;P but trust me the pigments were much more pigmented than it comes out here. 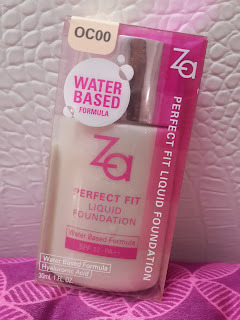 Sprayed Vichy Facemist then applied moisturiser. 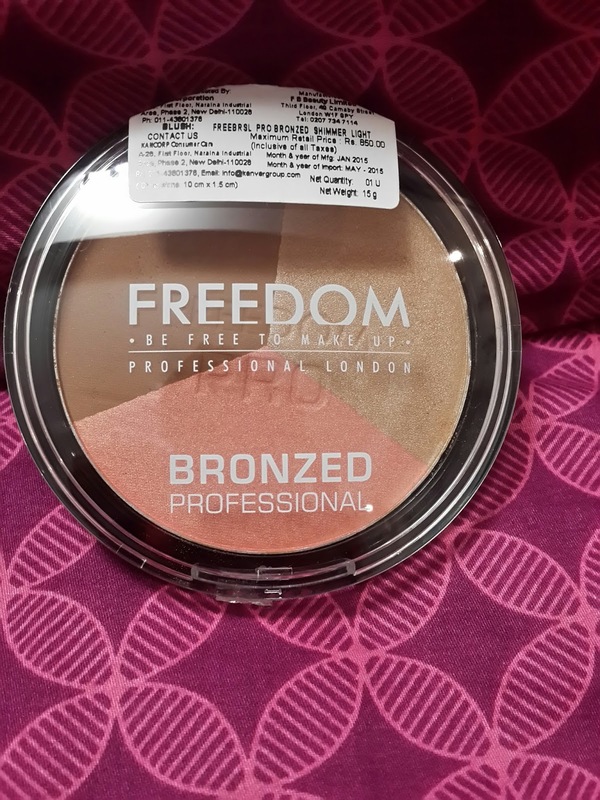 Then added Loreal transparent sunscreen, it adds a bit of glow and protects from Uv rays. 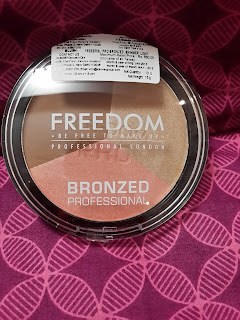 Then applied my Maybelline Fit me Concealer (which i reviewed for you you can check it here-maybelline fit-me ) under eyes and bridge of nose,centre of forehead and all whr i required it! 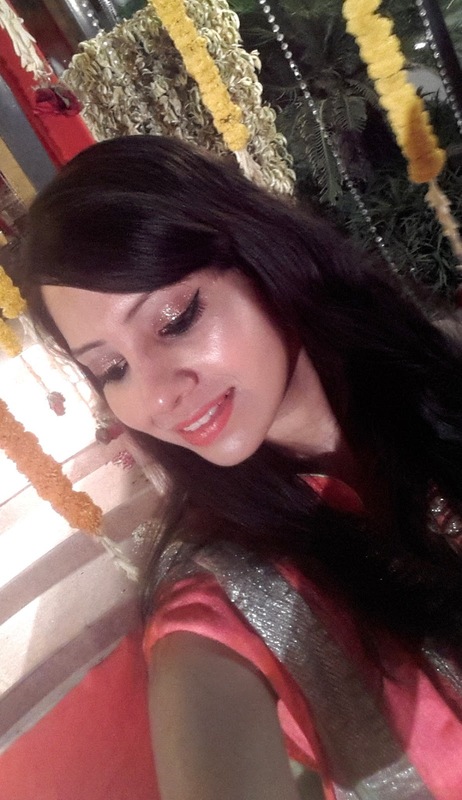 Then set my face with my Rimmel Stay matte powder as i needed to stay matte for a long wedding occassion. 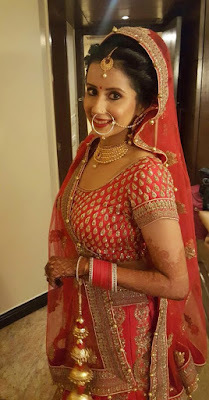 I also set my under eyes with my Anastasia beverly hills contour pallete in Banana shade and then contoured my face as i required it for the wedding. 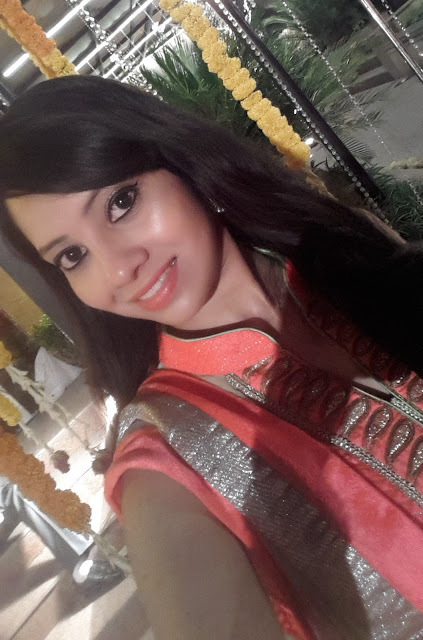 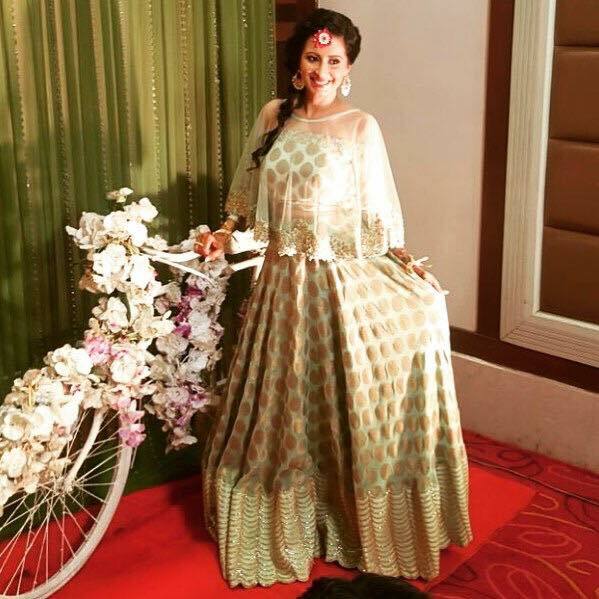 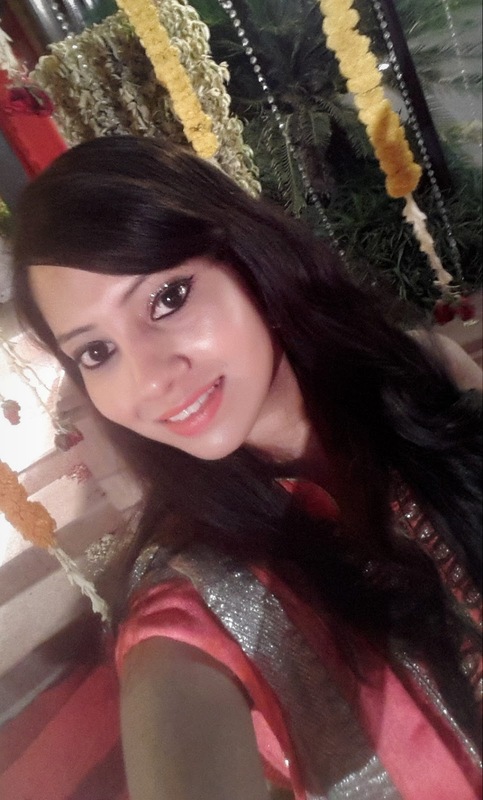 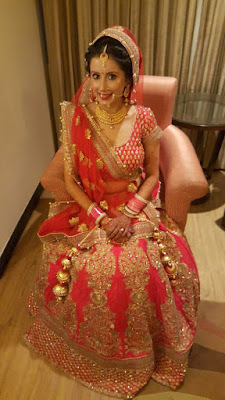 Now lets look into what the BRIDE (Sneha) wore for her Mehendi night followed with her wedding and reception. So girls I hope you liked our looks and the post, if yes don't forget to share my post with your girlfriends so that they can benefit from my posts.Also Signup on the blog with your gmail id by clicking on "Join this site" button on the top right corner to get notified for future posts.